There's usually about 20% of people on the list for any 27dinner we've had in Joburg or Cape Town that don't pitch up on the night. 27dinner Durban had 100% attendance. This was the first sign that it was going to be a good evening. The people who spoke were excellent, as we're used to at the dinners - no surprise there. We had Michael Chadbourne talking about his open-education project "Coco Maths" - an interactive presentation that asked us to solve a Pythagorean problem in 3d. Then Anice Hassim spoke about the phenomenal success that East Coast Radio has had with the blogs, podcasts and other forms of transmedia storytelling. There was a strong open-source contingent represented, including a chap from OpenOffice.org and some Ubuntu folks. There were internet entrepreneurs, online PR people, and some corporate IT and marketing people too. I also met a guy there who I went to school with and haven't seen since 1994! 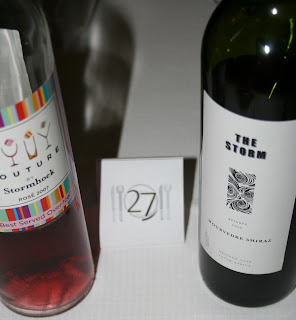 Graham Knox supplied the Stormhoek wine, E2 did a t-shirt give-away. Storm Telecom gave us some geek goodies, and East Coast Radio gave us each a filled brandbag. When it came to paying the bill, Anice spontaneously volunteered to pay for everyone's food and drinks. He said it was in the interests of community development, particularly in the new-media industry in Durban. There was such positivity, excellence and a sense of progressiveness in community development among the people there. Much respect to Marc Forrest for putting it together.